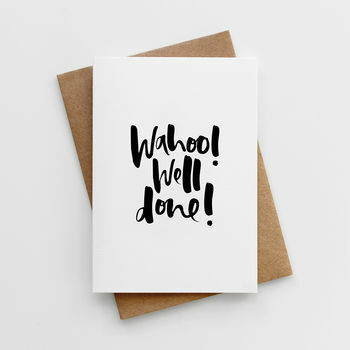 A unique and contemporary hand lettered card designed to celebrate a special achievement. This well done card makes the perfect choice in celebrating some happy news. Featuring our classic, hand lettered typography, the phrase 'Wahoo! Well Done!' is printed on luxurious FSC certified 350sgm textured card and teamed with a recycled kraft envelope. Our cards are created with love and hand packed with care for that extra-special touch. 'Wahoo! Well Done!' Congratulations Card is 10.5 x 14.8cm (A6) and comes with a 11.4 x 16.2cm (C6) envelope.